Yes, I corrected all the damn stickers. I just got checked out a DVD set of the BBC TV Hitchhiker's Guide To The Galaxy, from the Library. Talk about timing - if there was ever a time when I need to know to DON'T PANIC, it's now. NOTE: Carla has notified me she's not going to San Diego, so we ARE changing the comicon to July 14-15, 2018. Read on for all links and details, to make sure you're in sync. We WILL run the ads in the Stranger for the weekend of 14-15. First of all, ROOMS: The Winter Summer Inn - our convention B and B - KNOWS about this, and will hold the rooms for the evenings of the 13-14 (Friday, Saturday), on Fun Days. I called Sandy, and everything's changed, so be sure to use the new dates. So Engage Your Enthusiasm, and don't worry. It's just Life. Now for the story of why we had to change weekends. Last year, I checked and double-checked to make sure that the 2018 Clallam Bay/Sekiu Fun Days was going to be held on the same weekend as the Fourth of July. ie, from July 6-8. Carla Speed McNeil is working with me to make sure she gets all the funding she needs to travel out here and back, and have full accomadations, as our Guest of Honor. The festival has been right after the 4th, for several years now. The 4th kept getting closer and closer to the weekend every year, so I knew Fun Days would have to move ahead to the next week. But we were fine for 2018. Right? Stickers printed up and everything. Clallam Bay/Sekiu Fun Days. That's right. The weekend of the 13th-15th. Now Fun Days is run by one person, really, just like our comicon. Trish has a mass of things to keep track of, and this year she's trying to coordinate an even BIGGER music festival. I absolutely do not blame her for holding the festival the next weekend. The Fourth is a huge holiday up here, and two festivals so close together were becoming logistically impossible (And I certainly congratulate her and Bob on making the music festival work - I can't wait). SO - because I knew that one of the reasons that everyone came up here was for Fun Days, which includes a parade, side events and FIREWORKS, I had to think seriously about moving the date to the 14th-15th. I thought, oh, no, Carla is no doubt going to San Diego Comicon, which runs July 19th to 22nd. Asking her to fly down from our convention without rest in between would have been ridiculous. That show is a MONSTER. It takes full power, for at least a week. I really couldn't ask her to do that; it wouldn't be fair to her, at all. Carla's solved THAT. Her word about San Diego: "No way am I going near THAT Katrina." So she's coming straight out to us, for the comicon and Fun Days. 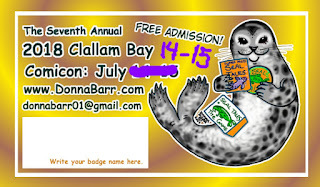 So - why would it have been so bad to just hold the Clallam Bay Comicon on its own? Because of the grant that covers the Stranger ad. 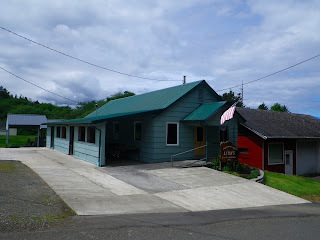 We won that grant, with the assistance of the Clallam Bay Chamber of Commerce, and the assurance that we would always include mention of Fun Days in any advertising and the website. That was fine. Yay! BUT - the grant wasn't forthcoming unless we had insurance on our event. You all know what a funky little creative-oriented little show mine is. There's not the money to shell out for insurance. We hold the comicon in the Lion's Club, but their insurance only covers their events. Not that it matters - what's going to happen? Somebody falls off a chair? And Fun Days, knowing we needed to insurance to get the ad grant, graciously took us under their wing, and covered us with THEIR insurance! Is this a great little community, or what? But - if we're on the earlier weekend, are we covered for insurance, and if we're not, do we get the grant? I doubt it - and nobody can blame them. They have safety considerations, and can't be held responsible because somebody lets their kid walk into the undertow on the beach in the dark to try to retrieve fireworks. Insurance is absolutely necessary for Fun Days, and all the Really Wild Things it entails. I doubt it starts up the weekend before. So, after typing up all kinds of emails and social media posts with "I'm changing the Date!" "I'm Not!" "Marvin, pick up that piece of paper!" I am going to accept the Hitchhiker's admonition and NOT panic. We have several months, and in that time, I'll gently lead everyone to agreement and schedule coordination, and it will Be Right. It Will Work. AND it has! Thanks to the terribly patient and kindly Diana at the Stranger, who has been working so hard to try to help us make this work. There WILL be the comicon. There WILL be Fun Days. There WILL be small furry creatures from Alpha Centauri.